There are many reasons you might say, “I need to sell my house.” If you need to do so quickly, the market isn’t always on your side. Instead of stressing about hiring a real estate agent, contact Honeybee Home Buyers in Arlington. We’re a group of real estate professionals who purchase homes that people need to sell quickly. If you say, “I need to sell my house quickly,” we can help. There’s no need to clean or make repairs, either. We can check out your house within 24 hours or when it’s convenient for you and make you an offer right away. What are you waiting for? Give us a call today if you need to sell your home quickly for any of the following reasons. Whether you’re getting married or bringing a new life into the world, sometimes your current home doesn’t have the space to accommodate a new family member. Instead of putting belongings in storage to make room, selling your house might be a better and more permanent option to welcome your new family member. Sometimes when your family changes size, it isn’t always growing. Things happen in life that we don’t always plan for; divorce is one of those situations. If you’re going through a divorce or a breakup, selling your house might be part of the process. If you need to sell quickly, contact Honeybee Home Buyers and one of our real estate professionals may be able to make you an offer. Whether you’ve inherited a home from a family member or a loved one in your home has died, you now have a piece of property that you can’t afford or don’t want to maintain. Don’t worry about the financial burden of making payments on a home when you’re mourning a loss. Contact Honeybee Home Buyers. If you’re moving for a job or you’re moving in with someone, you can’t wait around for your house to sell. You’re making a big transition and don’t need to worry about maintaining or paying for your old home. Instead of listing your home or hiring a real estate agent, contact Honeybee Home Buyers to sell your house quickly. You should always feel safe in your neighborhood and you should always feel like you belong there. If your neighborhood has changed and you don’t feel it matches your lifestyle anymore, it could be time to move. If crime rates have risen and you feel like you or your family is in danger, it’s definitely time to relocate. If you need to get out of your home as soon as possible, contact Honeybee Home Buyers. We will be able to make you an offer as soon as we view the home. 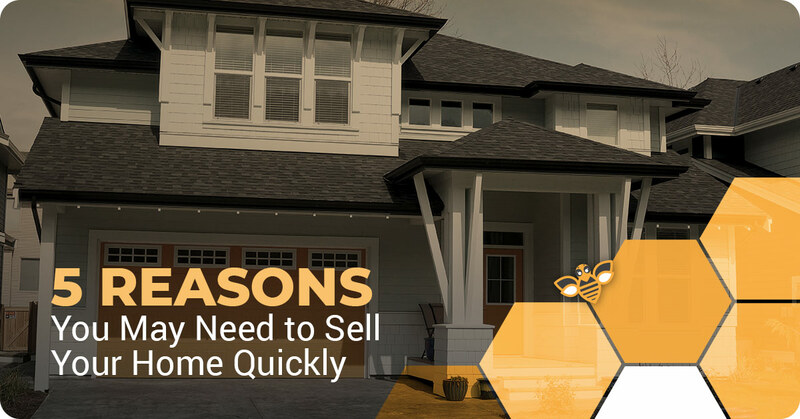 There are plenty of reasons you could realize that you need to sell your house quickly. Whether it’s become a financial burden, you’re relocating for a job, or any other reason, Honeybee Home Buyers is here to help. Contact us today to schedule an appointment for us to see your home.